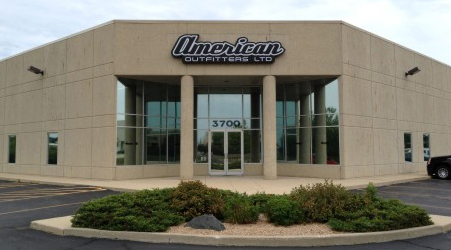 American Outfitters, Ltd. started out in 1975 in Waukegan, Illinois, as a small family owned business designed to fill a niche in the t-shirt market. The owners, Larry and Gary Rettig, were determined to see their business grow and expand. Over the years, our Screen Printing Department evolved from a manual operated transfer machine to complete manual and automatic press capabilities. We have since been recognized by Impressions Magazine as one of the nation's Top 100 Screen Printers. In 2008, American Outfitters Ltd was ranked 44th in the list of top-volume decorators by Impressions Magazine with over 560,000 imprints. Our Embroidery Department started out using a single head chain stitch machine. The process involved tracing a design and embroidering the garments one at a time, making it very tedious and time consuming. As our business grew, we added multiple head, computerized embroidery machines, which use digitized designs. We now have the capability of embroidering not only all types of wearables, but also a variety of items including hats, bags and chair backs. Our Graphic Arts Department started off developing and refining artwork designed for screen printing and was expanded to include in-house digitizing. This gave us the control over the quality of the embroidery designs that we were producing. We further expanded the Graphics Art Department to include producing digital graphics and vinyl banners. Our most recent addition of Ad Specialty Products Division has improved our capabilities in providing our customers with nearly one million products to enhance their image. Through all the years of our growth and expansion in the production areas of the company, we have also developed and improved our Customer Service & Sales Departments, Purchasing & Accounting Departments, and Shipping & Receiving Department. We incorporate a totally integrated software system to track each order from inception to completion. These are the behind the scenes departments that ensure smooth operations for the company as a whole. Even though we have grown past the point of being classified as a family owned business, we continue to operate with the family values with which we started.